This program helps patients to manage their weight through nutrition and healthy lifestyle counseling. Nutrition tips for weight loss, diet and active living are some of the topics covered in group sessions. The program is offered as a group visit, held at the Maitland Valley Medical Clinic. The program is offered once a month at the Maitland Valley Medical Clinic. Call 519-524-6060 ext. 506 for more information about the latest dates and times for the program. 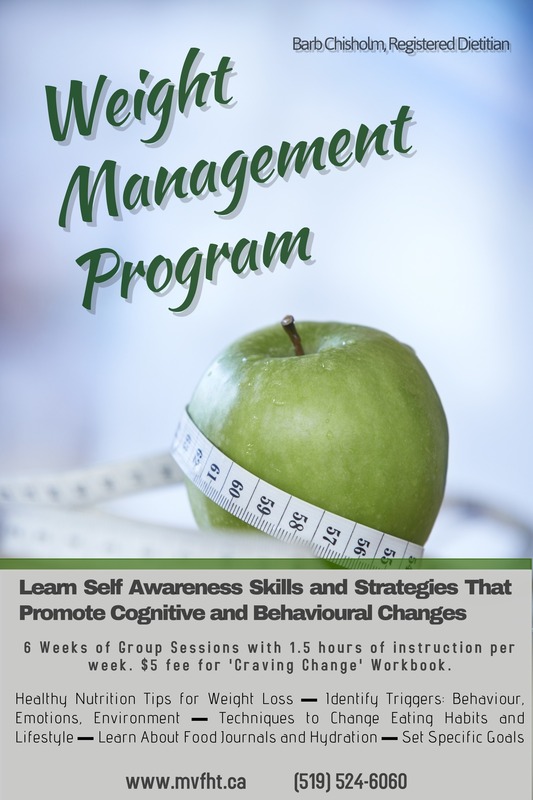 This program focuses on increasing your confidence and helps you to take control of emotional eating. Includes your own workout with invaluable information that you can keep and reread anytime you need to. The program is led by Maitland Valley Family Health Team Dietician Barb Chisholm and the Alexandra Marine General Hospital Dietician Yvonne MacRae. The program is open to everyone in the community. To register please call the Maitland Valley Medical Centre at 519-524-6060 ext. 506. You may also follow the link at the bottom of the page to self-refer online.